If you follow us on social media, you may have noticed our feeds have been chock-full of dinosaurs! That’s because we’ve been busy working on our new play Stan, written by our very own Sarah Emmott. A bilingual production performed in English and British Sign Language (BSL), Stan is a new play for children which explores communication, friendship, identity, the family unit… and dinosaurs. As part of our recent Research and Development period of Stan we’ve been working with Rachel Moffatt-Feldman, a wonderful British Sign Language Interpreter. We learnt a lot about working with interpreters and wanted to share that learning, so asked Rach to offer her top tips for working with ‘terps. A British Sign Language interpreter is not a machine, invisible nor an expert on all subjects. We are also not the Deaf person’s carer or relative. Chances are that we have never met the Deaf person before and we are learning the subject of the discussion as we go along. However, as interpreters we are very good at thinking on our feet, learning quickly and making everyone feel at ease. What you can do to help us do our job to the best of our ability is a number of things. Firstly, only one person should speak at one time. We only have two hands, as we are not octopuses nor are we aliens with the capacity to hold two or more conversations at one time. Secondly, if you are going to use lots of jargon and acronyms, please give us a cheat sheet before the discussion. This greatly reduces our stress and the need to keep interrupting the conversation. Thirdly, give us breaks, especially if we are working alone. Our brains are listening, understanding, translating, producing and watching, all at the same time. This is exhausting! Even just five minutes every 45 minutes would greatly help keep our brains going. What would be nice is if we could have comfy chairs to sit on. Hours spent sitting in uncomfortable chairs every day means we spend a fortune at the local beauty shop getting a massage. Great for them, bad for my pockets. Good lighting, blinds or curtains for windows and a quiet room are ideal, but don’t always happen. Theatre interpreting is a wonderful experience when working with people who understand my role. Rather than just using the interpreter as a means to communicate with the Deaf person, use us in the play. Put us on stage and not just in the corner. 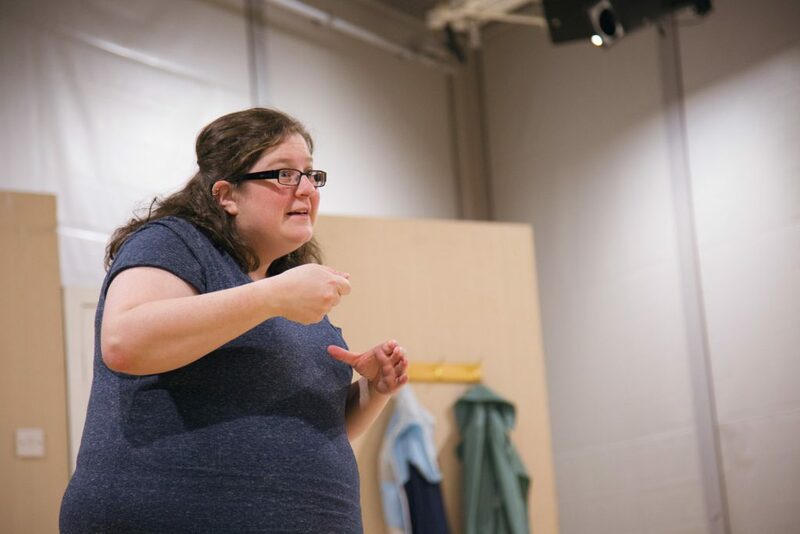 Sign Language interpreters are born performers so use us and our skills to truly make the theatre a creative and engaging experience for the whole audience.